Ok, back to summer salads! This particular couscous salad is Cheryl’s favorite. I’m not sure if there’s a special ingredient in it she really likes or if it’s the combination of everything, but whatever it is she gets very happy when I make it. As with most of my summer creations, this couscous salad is very easy to make, can be made ahead, and is perfect for hot evenings when you don’t want to do much cooking. The most important ingredient you’re going to need for this recipe is the couscous. There are lots of different sizes of couscous out there and for this one you’re going to need the bigger kind. At Trader Joe’s it’s called Israeli couscous, at our local Treasure Island it’s called Middle Eastern. Pretty much the same thing. It’s a bigger “pearl” than normal couscous and makes for a better salad ingredient in my opinion. Like many summer salad bases, it’s very versatile and you can add many different side ingredients. I like to add some salty items and some sweet ones so you get a nice contrast. Throw in a crunchy vegetable and you’ve got the makings of a delicious side dish. One trick I use is putting the hot, cooked couscous on top of the raisins so they soften and plump up a little from the moisture. I do that first and then go about taking care of the other ingredients like chopping the olives, and sautéing the carrots. Don’t know if it actually makes a difference but I like to think so. It’s hard to believe we’re almost a third of the way through August. Before we know it fall will be here so make the most of enjoying the last bits of summer before heading back into the kitchen! Bring 3 cups of water to a boil. Add couscous, remove from heat, and cover. Allow to sit for 5 minutes or until water is soaked up and couscous is tender. Put the raisins in the bottom of a large bowl. Cover raisins with the still warm couscous. In a separate pan melt the butter over med-high heat and add the curry powder and cumin. Add the carrots, toss to coat with the butter-spice mixture and sauté for 5 minutes until they begin to soften. 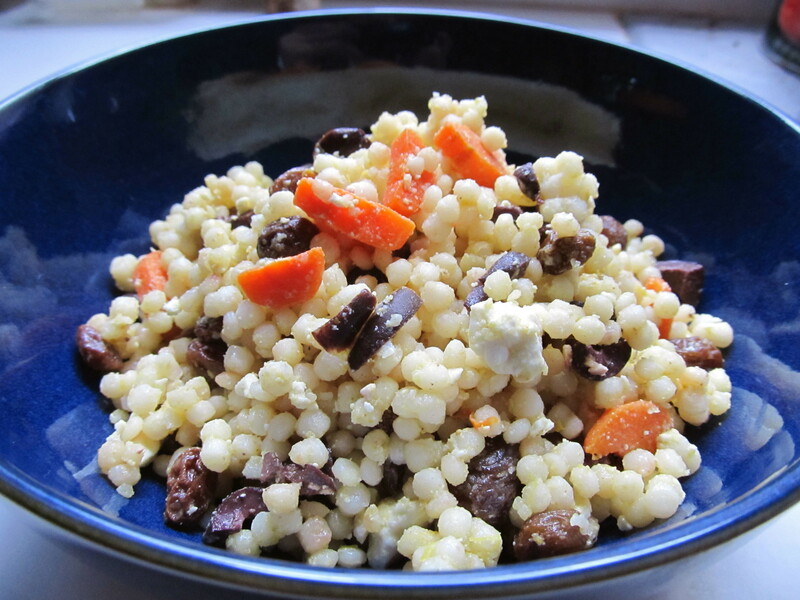 Add the carrots, chopped olives, and lemon zest to the couscous and mix thoroughly, stirring up the raisins from the bottom in the process. Before serving add the cheese, lemon juice, pinch of salt, and drizzle some olive oil in for taste. Mix. Adjust seasonings (more salt, lemon juice, or olive oil) and serve. Looks really good! Thanks for sharing your recipe.